We only ever get fleeting glimpses of bats as they flutter overhead like dark scraps of leather, mysterious in the night. These glimpses have inspired legends about vampires, witches and devils, striking fear into people who associate bats with dark magic and blood drinking. In some places, bats are killed and their blood and oils used in ineffective ‘cures’ for asthma and other ailments; in other places they are thought of as vermin and persecuted simply for existing. But what do we really know about these elusive night animals? Firstly, that they are truly remarkable creatures. 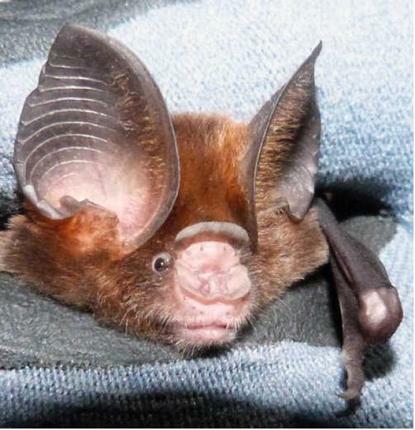 Usually large animals like elephants live much longer than small animals like mice, but bats can live for twenty years or more despite being very small. This means that they form close relationships with other bats in the same ‘roost’ or home, as they live together for so long. Bats are mammals; they feed their young on milk and have fur not feathers or scales. While flying squirrels and the like can glide from tree to tree, bats are the only mammals that can actually fly for many miles. Contrary to popular belief, all bats can see, and many of them also have the amazing ability to echolocate which allows them to fly about in total darkness.In India there are around 120 bat species – about 10% of all bats species in the world – but we know very little about many of them. In the Western Ghats, we have found several species never known from the area before, in just a few months’ work. It goes to show how much we have to learn! Worldwide, one in four bat species is threatened with extinction or a decline in numbers, including many in India. But why should we care? As we study bats more, we’ve begun to realise how important bats are to us. Most species of bats eat insects that come out at night, that aren’t eaten by birds in the daytime. This includes mosquitoes and midges than can spread dangerous diseases, and insects that eat farmer’s crops. One single bat can consume up to 3000 insects in a night – think how many more itchy mosquito bites we’d all have if there were no bats eating them! Farmers save billions of dollars worldwide because animals like bats eat crop pests. Farmers would have to spend a lot more on pesticides if we didn’t have natural insect control. Some bats in tropical places like India eat fruit. While they do chew on some fruit crops, these bats pollinate rainforest trees and fruit farms alike and spread the fruit seeds far and wide, ensuring that new trees will grow. Some of our favourite foods are pollinated or have their seeds dispersed by bats. But all this work goes on under cover of darkness, so mostly it isn’t appreciated. So the next time you see a bat flutter overhead, don’t be scared: enjoy the sight of one of nature’s marvels! This article appeared in the Hindu in School on 2 May 2012.